What's the best wintertime subcompact? Winter is right around the corner. Heck, some of my friends in Minnesota have already received measurable snowfall. I've got my mismatched studded winter tires ready for my Yaris, and our AWD Suzuki SX4 is just itching for its first trip up the mountain. 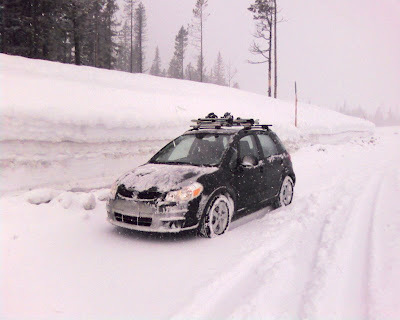 The AWD SX4 gets my vote for best currently available subcompact in the the snow, at least in the U.S. It's got all-wheel drive and a "lock" mode that splits power 50/50 to the front/rear wheels—great in the deep stuff. Let's not discount the ability of some FWD vehicles with a good set of snow tires, too. My old 1979 Honda Civic 1200, with it's 145/80/12 tires was beast in the snow. So what do you think the best wintertime subcompact is or was? I had some 175/?/14s on my 89 Accord, and they were Winterforce, by firestone, which is totally effing ridiculous. The tread is so aggressive, so knobby, it really shames Blizzaks and Nokians in the white stuff. On ice, I'm sure blizzaks/nokians would be marginally better due to more siping, but the combination of extremely low cost with extremely nutso insane tread pattern/depth= a huge win in my book. My accord would go places my Subaru had trouble. As for the best winter car, I'd say something crappy, not a nice new suzuki that will eventually rust out. Think Subaru Loyale, Camry All-Track, Tercel 4wd, things like that. Why? Salt. And other drivers who are stupid enough to avoid buying snow tires. No sense in driving something too nice during the winter with all the idiots yapping on cell phones. do the old vw beetles count? Sure thing. I've heard the old air-cooled VWs were good in the snow. Rear engine, rear-wheel drive = traction. My vote goes to the SX4 or Fit with dedicated snow tires. My vote for an old vehicle goes to the grandfather of the CR-V, the Civic Wagon with RT-4WD. Yes—the old Civic wagons were indeed snowcats! Nothing (with 2wd that is) was better in the white stuff than a classic saab 900. I had a 87 900s and even with crappy allseason tires that thing was unstopable. Saabs, especially the older ones, were famous for being great snow cars!